Looking for Website Conversion Optimization guidance ? A must-read book to help you out! Landing Page Optimization: The Definitive Guide to Testing & Tuning for Conversions. 2nd Edition. by Tim Ash, Maura Ginty and Rich Page. Though I haven’t finish the book yet, I’ll nevertheless share a glimpse if what I read so far. Out of five part, I just finish the 2nd and there is already a lot to remind. This book is a must-read guide to help you understand how to improve your website, why you should do it and how you should measure it. Let me rewind quickly: When I first bought this book I was expecting to read about landing page optimization as the book title stand what was my suprise when i realized that I’ll learn far more in this book. To be fair, it’s totally possible that my definition of landing page was far too restrictive. Let’s first define landing page! According to Tim Ash book, “a landing page is any webpage on which an internet visitor first arrives on their way to an important action that you want them to take on your site”. According to me in light of this book and my work experiences, a landing page is in a digital marketing context any page of your owned online presence where a user will land regardless of the fact that he was searching for it or that you pushed the content to him. Hence this will regroup your site homepage commonly, your top entries page for organic searches, paid searches, online advertising… but also your standalone paid search landing pages, your Facebook page… Well this almost every page online 🙂 yes and no, it’s great to think that every page deserve your attention and need to be optimized but just stating the obvious you kind of need to focus your attention on what matters which is what’s driving your business and what is bringing money as when we speak about landing page optimization at the end of the day we speak about bringing value for your customers and $$ for your business to grow. In other words: optimizing your site conversion. This a very complete book hence I can just suggest you to read it. What is conversion? 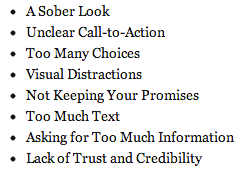 Persuading users to take the desired action(s). 1. Define your business goals – For instance if you are an e-commerce website, your main business goal is to increase your online revenue & profit. 2. Define the way to measure achievement / success and the associated metrics / KPI – For instance, you’ll want to measure your daily online revenue, you conversion rate (orders to visits), your AOV and your ROI. 3. List few digital initiatives to get there – For instance, you’ll want to increase the proportion of users who checkout or increase the average order value per consumers. The inherent challenge here is to know to whom you are adressing these digital initiatives, the book identified them as the ‘Maybes’ : those who may take the desired action. In opposition to the Yesses, who will always take the desired actions or the Noes who will never take the desired actions. The maybes are gold and where lies a chance to increase your conversion. Which conversion actions for which business models? 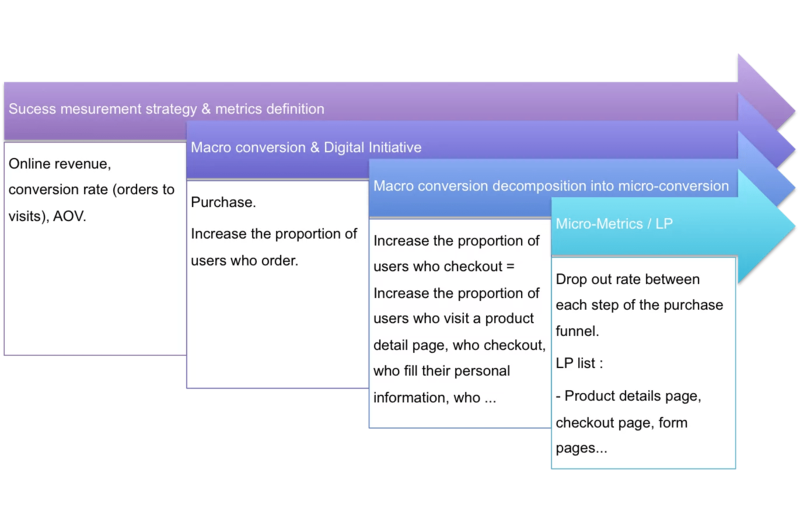 Each of these conversion actions which are macro-conversions, needs to be split into micro-conversions & associated with their metrics. How could we influence the users actions? Now that we know what we are trying to improve and which landing page to focus on: in our example, each step of the purchase funnel. We need to define the how-to. AIDA is a marketing concept by E. St. Elmo Lewis that describes a common list of stages that may occur when a consumer engages with your brand or products. In Tim Ash book, this concept is used as a framework to follow to get a better understanding of the user decision-making process and to put up a checklist of does and don’t in your optimization journey. Interest is the stage when you need to capture the user attention and transform is scanning mode to a commited mode. Action is the stage where you want your visitors to complete the transaction. That’s where I will stop, I won’t spoil your pleasure to read the book and learn a lot of useful tips & tricks to improve your website, nor unveil all the secrets ingredients of the entire book here ! Let’s kick off this year with a list of wishful thinking and future articles, I certainly hope I will be able to work deeply on all those subjects and more but I do realize that not everything will be achievable ! 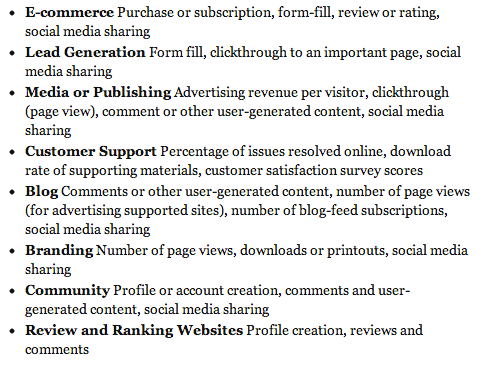 I am sharing this list as I intend to write about all those topics this year, so stay tuned if one those items – segmentation, landing page optimization, cross-platform analytics, campaign performance measurement, site search… – is a previous, present or future topic of interest. In a recent article, When Analytics is King, Segmentation and Targeting are Queens, I was giving my opinion on how important segmentation is to do a better analytics job. There is various ways of doing segmentation and one of the efficient one is to based your audience segmentation on personae. Personae concept goes beyond demographic segmentation, I will soon dive deeper into this subject in the meantime, this article helps to understand the usage of personae in digital marketing. This topic is very large, my objective here is to finish Tim Ash’ book: Landing Page Optimization: The Definitive Guide to Testing and Tuning for Conversions, this book covers how to prepare all types of content for testing, how to interpret results, recognize the seven common design mistakes, and much more. (Amazon quote). I start reading it few weeks ago, it’s a highly valuable book, can’t wait to share with you a full review of it. Attribution Modeling & Testing : How to improve campaign allocation performance measurement ? Hopefully, performance improvement is a journey, not a destination. 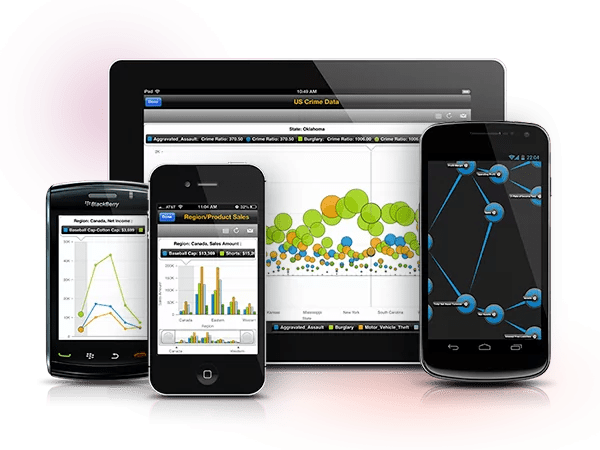 When it comes to digital marketing and campaign budget allocation, the equation gets more and more complex as the channels are numerous (Search, Display, Facebook etc.) and understanding each channel contribution to your performance (revenue, micro conversions, user experience…) is a tough job. 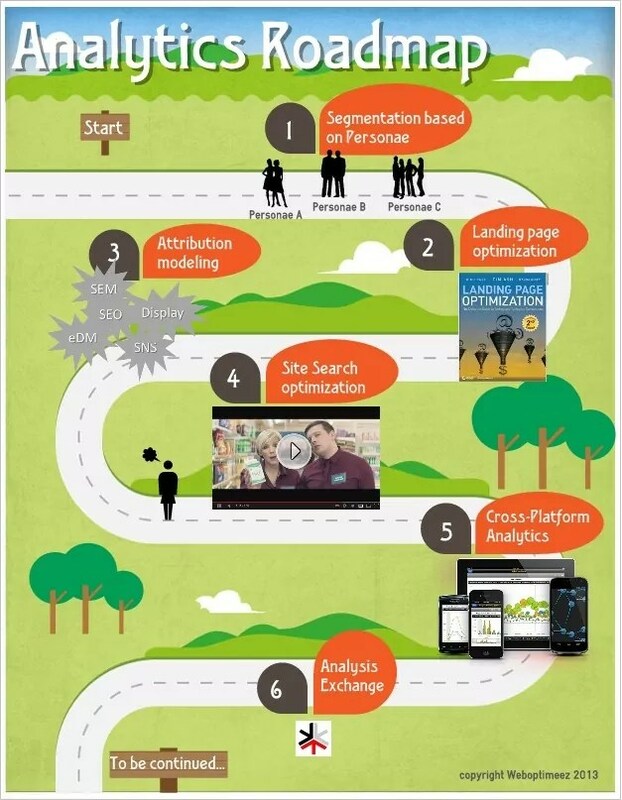 Attribution models and testing is a step in this journey. This hilarious video of Google Analytics reminds me, how important site search is, I remember reading in a usability study that approx. 30% of your visitors will ignore your navigation, content links and hero images and use ONLY your internal search tool to look for what they are searching. Well, I do hate common views however this one worth taking the time to dig a little deeper and capture the main metrics to help your visitors find what they are looking for in your website in a efficient way. A few articles this month claims : 2013 is the year of mobile analytics or 2013 is still not the year of mobile analytics, 2013 is the year of … Well, i don’t really care as the platform of today is certainly the old man of tomorrow’s platform. So I want 2013 to be the year of cross platform analytics : mobile, tablets, desktop, Tv… Whatever ! Where your clients/prospects are, you want to be looking at! I joined the Analysis Exchange as a mentor last year, I didn’t have the chance to participate yet, well I hope that 2013 will be the year of my contribution. This exchange is a pretty exiting project run by Web Analytics Demystified to increase practice of web analytics by providing free web analytics consulting to non-profits and NGOs around the world.